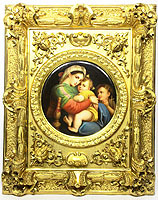 A Very Fine German 19th Century Circular Porcelain Plaque Painting of La Madonna della Sedia After Raphael Sanzio (1483-1520), depicting a seated Madonna and Child next to a child Saint John the Baptist, within a gilt wood carved figural frame, the plaque inscribed "Raphael" on the reverse and bearing a label that reads "Julius Greiner Sohn - Dresden A. Pragerstr. 251". 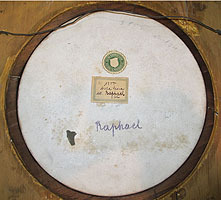 Another inventory label reads "1800 Della Sedia 465 -Raphael CM". Circa: 1890. 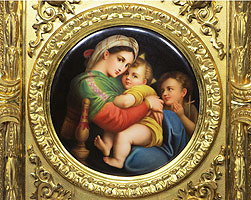 The original painting of La Madonna della Sedia (The Madonna of the chair) by Raphael Sanzio (1483-1520) is presently part of the collection of the Palazzo Pitti in Florence, Italy. Please click here to view a larger oil on canvas version of this painting available in our collection.